Limitations on contributions or expenditures made by individuals or organizations for the purpose of advocating causes or candidates in the public forum impinge directly on freedom of speech and association. Their implementation poses serious dangers to the First Amendment. They should be opposed in candidate as well as referenda elections. That position was right. “Campaign contributions” is simply like-minded people pooling their money to fund their speech. Limits on campaign contributions are no more or less than a limit on free association and speech. That position put the ACLU at odds with the bulk of the liberal establishment, who want to limit free speech. In fact, liberal politicians tried to cap expenditures as well as contributions (that is, the actual speech, and not just the free association to fund speech) but was blocked by the Supreme Court. That probably made for awkward moments at dinner parties. Anyway, whatever the reason, the ACLU Board of Directors has voted to reverse its position. The ACLU is now officially okay with limits on free speech. Some liberals have urged the FCC to reclassify the Internet as a “telecommunications service” in order to circumvent the court ruling barring the FCC from imposing network neutrality. Larry Downes says it’s not so simple. Oh? How much is enough, precisely? Last year, Barack Obama earned $5,623,690, according to his tax return. Is $5.6 million per year enough? Apparently not. If a smaller amount were “enough” you would expect that he would have given away the excess. He did not. In fact, he gave less than 6% of his income to charity. So whatever the “enough money” point is, I guess it’s higher than $5.6 million per year. POSTSCRIPT: Let me add a more serious response: Of course there are diminishing marginal returns to earning more money, but what point is enough is an individual decision. Does Obama have any appreciation for the concept of an individual decision? Moreover, does Obama not understand that people trying to make money is what drives the economy? When people decide they’ve made enough, they stop growing the economy and creating jobs. That’s bad, remember? The UN has elected Iran to a seat on its women’s rights commission. I guess they felt that con was underrepresented. Incidentally, the election was carried out by acclamation. The United States could have blocked it, or at least forced a vote, but chose not to. UPDATE: Officials say there was no mechanism by which this could have been blocked. Everything is settled in UN back-room deals. My reaction upon reading the opinion in this matter was not what I expected. Though I’m always pleased with the results of these investigations that prove the false allegations wrong, and I appreciate the detailed reasoning set forth in this recent opinion, I was primarily disappointed that the State of Alaska, the Attorney General’s office, and others, still have to spend time and resources addressing the abusive onslaught of frivolous complaints directed against me—even after I left office. And in case the phrase “lawful contact” makes it appear as if the police are authorized to act only if they observe an undocumented-looking person actually committing a crime, another section strips the statute of even that fig leaf of reassurance. “A person is guilty of trespassing,” the law provides, by being “present on any public or private land in this state” while lacking authorization to be in the United States — a new crime of breathing while undocumented. An earlier version of this Op-Ed essay referred incorrectly to the provisions of the new Arizona immigration statute. The version of the bill signed by the governor no longer includes a section under which undocumented immigrants would be guilty of trespassing for being on Arizona soil. Oops. Is it too much to expect that a “Distinguished Journalist in Residence” at Yale Law School might actually read the bill, or at least determine its provisions, before trashing it? Apparently so. Wasn’t the system of internal passports one of the most distasteful features of life in the Soviet Union and apartheid-era South Africa? Actually “distasteful” is far too mild a word. (But why limit your attention to bygone eras in the Soviet Union and South Africa? How about today’s UK? Oh, but the UK is run by progressives. Hmm.) However, if the law applies only to those who are arrested for a crime — as it does — that description really doesn’t apply. So now the piece is a hyperbolic expression of outrage (yes, it does compare the law to the Holocaust, if obliquely) without any hook to hang that outrage on. POSTSCRIPT: I feel compelled to remind my readers that I’m a proponent of open borders. I’m not concerned about Latin American immigrants changing the nature of our society or whatever. Unfortunately, open borders are incompatible with the welfare state. If we cannot prevent immigrants from becoming a drain on public finances (as seems to be a political and/or legal impossibility), we have to restrict immigration to those who can earn their keep. Personally I would rather fix the government and open the borders, but it’s not up to me. In any case, if we have immigration controls, Arizona is within its rights to turn over illegal immigrants that it arrests for other crimes to the federal government for deportation. As I understand it, that’s what the Arizona law does. Not being familiar with the debate, I’m not sure if I would support the bill. It certainly wouldn’t be a priority for me. But I also certainly don’t see it as some sort of Nazi-esque outrage. UPDATE: This was probably an honest (if stupid) mistake. But Greenhouse’s errors aren’t always innocent. In order to carry out the reconciliation shuffle, Democrats had to abandon their ambitions of putting overt price controls into their health care nationalization bill. That’s fortunate, because price controls are a complete disaster in Massachusetts. Naturally, Democrats are now working to bring Massachusetts’s woes to the rest of the country. POSTSCRIPT: The additional irony is that the bill did contain price controls that will push up rates for most customers. There is not a liberal America and a conservative America–there is the United States of America. There is not a black America and a white America and Latino America and Asian America–there’s the United States of America. This year, the stakes are higher than ever. It will be up to each of you to make sure that young people, African Americans, Latinos and women who powered our victory in 2008 stand together once again. After the iPhone video of McKenna’s beating emerged, investigators subpoenaed 60 hours of surveillance video from the College Park campus police. The only video police couldn’t manage to locate was the one from the camera aimed squarely at the area where McKenna was beaten. Funny how that works. Campus police claimed that a “technical error” with that particular camera caused it to record over the footage of the beating. As public pressure mounted, police later found what they claimed was a recording of the lost video. But two minutes of that video were missing. Coincidentally, those two minutes happened to depict key portions of McKenna’s beating. The kicker? The head of the campus video surveillance system, Lt. Joanne Ardovini, is married to one of the cops named in McKenna’s complaint. This looks really really bad. Graber was harassed, intimidated, illegally arrested, and jailed for an act that clearly wasn’t illegal. According to Graber, the name of the judge who signed off on the raid of his parents’ home doesn’t appear on the warrant. As Graber told Miller, “They told me they don’t want you to know who the judge is because of privacy.” If true, that statement is so absurd it’s mind numbing. A judge issued an illegal warrant for police to invade the private residence and rummage through the private belongings of a man who broke no laws, and we aren’t permitted to know the judge’s name in order to protect the judge’s privacy? The authorities in Maryland are out of control. UPDATE (9/28): Four months later, the charges against Graber have been dropped. Democrats covered up actuary report? Whether or not the Spectator is right now, there’s a lesson here: details matter. If you work for the MSM, you can afford to get the details wrong at first. If you’re on the outside, you have to get them right. If these allegations are substantiated, this is a huge scandal. Will the press investigate? One quickly notices a few things: (1) Not very many schools defend free speech. (2) Most of these are public schools; just three of the eleven (CMU, Dartmouth, Penn) are private. (3) Over a third are in a single state, Pennsylvania, the only state to have more than one. (4) Despite the high esteem in which the institutes of higher learning of Massachusetts and California are held, there’s not one from either state. The importation of toys with lead paint from China two years ago prompted Congress to pass the Consumer Product Safety Improvement Act (CPSIA), requiring extensive independent testing of all products sold — or resold — for children. The new regulations threatened to put small manufacturers and thrift shops out of business, thanks to the onerous burden of test costs. But what about the big manufacturer that actually put 2 million contaminated products on shelves? Mattel gets a waiver from testing requirements — again. The legislation passed in response to Mattel’s misconduct is driving Mattel’s competition out of business but exempting Mattel itself. This is an outrage, but it’s also typical. Big business pretends that it opposes new regulation, but usually it secretly loves regulation because it forces smaller competition out of business. Think about this as Democrats say they are going to punish Wall Street. The big firms are crying all the way to the bank, so to speak. GM is paying off its bailout debt using other bailout funds. Evidence of progress at GM this is not. UPDATE: The new definition of chutzpah: paying off 10% of your debt and then authoring an op-ed entitled “The GM Bailout: Paid Back in Full”. Mr. Clegg’s stance on those issues could make some in Washington nervous. In a speech this week he called for a shakeup in relations between the United States and the United Kingdom and described as “embarrassing the way Conservative and Labor politicians talk in this kind of slavish way about the special relationship.” He added that there were “profound differences” between the two countries and argued that the Obama administration had already written off the idea that Britain was a special ally. “If they are moving on, why on earth don’t we?” he said. Intentionally or not, Mr. Obama has offered support for Mr. Clegg’s argument: His relatively chilly relationship with Mr. Brown, including several perceived snubs, has been a persistent theme of British news coverage. Yet the United States can hardly afford a weaker or less friendly Britain at a time when it is still fighting two wars and when diplomacy with states such as Iran, North Korea and Syria is failing. Would it have been so hard to treat the Prime Minister and the Queen with respect, to repudiate State Department statements that the special relationship was over, and to express support for British oil claims off the Falklands coast? No, it wouldn’t have, but he didn’t. During the Bush administration, there was a lot of idle talk about how President Bush was damaging relations with our allies. Obama has actually done it. “That was not a good phrase, not a good use of language, it was not correct,” Mr. Hoyer, Maryland Democrat, said. . . Mr. Hoyer said he made a mistake in reading the op-ed too quickly and approving it. Nancy Pelosi did not join him in retracting the smear. Google’s roving Street View spycam may blur your face, but it’s got your number. The Street View service is under fire in Germany for scanning private WLAN networks, and recording users’ unique Mac (Media Access Control) addresses, as the car trundles along. . .
Google CEO Eric Schmidt recently said internet users shouldn’t worry about privacy unless they have something to hide. President Barack Obama’s health care overhaul law is getting a mixed verdict in the first comprehensive look by neutral experts: More Americans will be covered, but costs are also going up. . . But the analysis also found that the law falls short of the president’s twin goal of controlling runaway costs, raising projected spending by about 1 percent over 10 years. That increase could get bigger, since Medicare cuts in the law may be unrealistic and unsustainable, the report warned. . . In addition to flagging provider cuts as potentially unsustainable, the report projected that reductions in payments to private Medicare Advantage plans would trigger an exodus from the popular alternative. Enrollment would plummet by about 50 percent. Seniors leaving the private plans would still have health insurance under traditional Medicare, but many might face higher out-of-pocket costs. In another flashing yellow light, the report warned that a new voluntary long-term care insurance program created under the law faces “a very serious risk” of insolvency. So the new law drives health care costs up, even if you assume Medicare reimbursements will be cut, which of course they won’t be. The full report is here. No wonder Democrats wouldn’t wait for the report before passing the bill. BONUS: Kathleen Sebelius admits that she has no idea what the bill’s high-risk pools will cost. POSTSCRIPT: The report did say that the bill would extend health coverage to 34 million more people, but as people will discover, coverage is not necessarily the same thing as access. At a talk I attended yesterday, Allan Meltzer pointed out that the bill does nothing to expand the supply of health care. Primary-care physicians are already underpaid, and the bill assumes their pay will be cut further. Thus, expanding coverage merely moves the long lines for treatment out of the emergency room and into the physician’s office where all of us can enjoy them. UPDATE: In fact, most of the newly insured would be in Medicaid, which many doctors won’t accept because the reimbursement rates are so low. One of Alan Greenspan’s lesser-known contributions to the annals of the credit crisis was a pair of studies he co-authored for the Fed, sizing up exactly how much Americans borrowed against their home equity in the bubble and what it was they were spending their newfound (phantom) wealth on. Greenspan estimated that four-fifths of the trifold increase in American households’ mortgage debt between 1990 and 2006 resulted from “discretionary extraction of home equity.” Only one-fifth resulted from the purchase of new homes. In 2005 alone, U.S. homeowners extracted a half-trillion-plus dollars from their real estate via home-equity loans and cash-out refinances. Some $263 billion of the proceeds went to consumer spending and to pay off other debts. Only a fifth of the explosion in mortgage debt was actually people buying houses! Four-fifths was people extracting money from their houses, and about half of that went to consumer spending and other debts. A new report from the Congressional Budget Office finds that 3 million low- and middle-income taxpayers will be forced to pay the penalty for failure to obtain health insurance. The report finds that 3 million taxpayers earning up to 5 times the poverty line will be paying an average of $633 in penalties. (Five times the poverty line is $54k for an individual, and $110k for a family of four.) Worse, 400 thousand who are actually below the poverty line will be paying an average of $500 in penalties. That’s right, 400 thousand taxpayers in poverty will still be uninsured, and will also have to pay penalties. All of those are people to whom President Obama pledged he would not raise their taxes. An additional 900 thousand people over 5 times the poverty line will be paying the penalty, but the CBO report does not break that total up further. A few of those people are earning over the $250k threshold (about 23 times the poverty line for an individual, or 11 times for a family of four) at which Obama said tax increases would begin. The CBO estimate indicates that 45% of the penalty collections will be from low- and middle-income taxpayers under 5 times the poverty line. Court filings in Rod Blagojevich’s corruption case that were improperly redacted show that President Obama and others in the White House lied repeatedly about their contacts with the corrupt ex-governor. I had no contact with the governor or his office and so we were not, I was not aware of what was happening. I know he’s talked to the governor and there are a whole range of names many of which have surfaced, and I think he has a fondness for a lot of them. An Obama aide, speaking on the condition of anonymity, took back David Axelrod’s remark last month that Barack Obama and Rod Blagojevich had spoken recently. “What the president-elect said today is correct, David Axelrod misspoke,” the aide said. I was mistaken when I told an interviewer last month that the President-elect has spoken directly to Governor Blagojevich about the Senate vacancy. They did not then or at any time discuss the subject. Obama may have lied about conversations with convicted fraudster Tony Rezko. Obama may have overtly recommended Valerie Jarret for his Senate seat. A supporter of President Obama may have offered quid pro quo on a Jarrett senate appointment. Obama maintained a list of good Senate candidates. Rahm Emanuel allegedly floated Cheryl Jackson’s name for the Senate seat. Obama had a secret phone call with Blagojevich. I find it amazing that Obama ever tried to maintain that he had not talked to Blagojevich about the seat. I find it even more amazing that he tried to maintain he had not talked to Blagojevich at all. Of course he talked to Blagojevich, and of course he talked to him about the seat. It’s inconceivable that he wouldn’t. But I guess he thought that the proof could be kept under wraps, and without proof the matter would go away. It worked until now. Is it a big deal that the president and his staff lied repeatedly about his contacts with Blagojevich? One would think so. Selling a US Senate seat is a big scandal, even for Chicago, and Obama has placed himself into it. Will it be treated as such? Probably not. A free market was never meant to be a free license to take whatever you can get, however you can get it. Oh, surely not. Everyone knows that’s the job of government. Two weeks ago it was discovered that Congress accidentally stripped itself of its health insurance as part of the health care nationalization bill. The Congressional Research Service noted that the Congressional health plan would be shut down immediately, but the new exchanges (though which Congress is to acquire its health care) won’t be created for years. In response to your inquiries, this is to advise you that the Office of Personnel Management has concluded that Section 1312(d)(3)(D) of the Affordable Care Act, Public Law No. 111-148, is not effective until the state exchanges referenced in section 1312(d)(3)(D)become operational. The provision accordingly has no current effect upon the eligibility of Members of Congress or their staffs to participate in the Federal Employees Health Benefits Program (FEHBP). Members and their staffs are eligible to continue to participate fully in the FEHBP. Accordingly, the responsible employing offices within Congress should continue to process the enrollments of Members and their staffs in FEHBP plans. You’ll note that the announcement contains not one word of legal argument in support of its conclusion, saying merely that “the Office of Personnel Management has concluded”. This outrage is expected, but it’s an outrage nonetheless. Someone ought to sue. Sure, it would be petty, but it’s important that the people who passed this bill without reading it face the consequences of their malfeasance. POSTSCRIPT: As long as we are tossing the law aside, I wish the Office of Personnel Management could issue an announcement that would let the rest of us keep our health insurance too. The U.S. Court of Appeals for the Second Circuit has issued a stay on the December 2009 injunction by Clinton-appointed Judge Nina Gershon that declared the Association of Community Organizers for Reform Now (ACORN) funding ban was unconstitutional. The result of the stay is that the Congressional funding ban will go back into effect, and ACORN will not receive taxpayer dollars while the court reviews the case. Forget about winning the time slot. Keith Olbermann isn’t even the most popular host of his own program. A new Pentagon report reveals. Appeasement isn’t working. Sounds like we need more appeasement! After the Democrats passed their health care nationalization bill in the face of strong public opposition, they tried to put a brave face on the public outrage, arguing that the public would like the bill once they came to understand it. Democrats, we were told, would be delighted to campaign on the issue. Three months ago, at a private meeting of nervous House Democratic lawmakers, President Obama promised to put the full weight of his office behind the marketing of the health-care bill once it became law. “We’ve spent so much time talking about the House bill versus the Senate bill that we haven’t been able to talk about how great the bill is overall. Once we have a final bill, we can really talk about how it’s going to help Americans,” Obama said at the time. But since April 1, the subject has hardly escaped his lips publicly, and it looks like the entire month of April might go by without a presidential event focused on health care. The White House announced Tuesday that his next swing through Main Street America — a trip to Iowa, Missouri and Illinois next week — will focus on jobs and the economy as Obama meets with small-business owners and farmers. There was no mention of health care in the announcement. Ridiculous. Who ever heard of a parasite saying thank you? “With sufficient foreign assistance, Iran could probably develop and test an intercontinental ballistic missile (ICBM) capable of reaching the United States by 2015,” says a new 12 page unclassified report prepared by the Department of Defense on the Iran Military Threat. Meanwhile, we have no strategy for dealing with Iran. Bill Clinton’s op-ed last weekend did accomplish one thing. I had begun to look back wistfully at the Clinton administration as a time when a Democratic president was generally competent. His op-ed reminds me why I despised him so much at the time. We should remember that there is a big difference between criticizing a policy or a politician and demonizing the government that guarantees our freedoms and the public servants who enforce our laws. . .
As we exercise the right to advocate our views, and as we animate our supporters, we must all assume responsibility for our words and actions before they enter a vast echo chamber and reach those both serious and delirious, connected and unhinged. A few years ago, the left went apoplectic about Ari Fleischer’s remark after 9-11 that Americans should “watch what they say”. (In fact, the remark was taken out of context and referred to one politician’s statement that anyone wearing “a diaper on his head” should be investigated.) Now we have Bill Clinton saying the same thing, and this time it’s fully in context. Clinton’s argument that criticism of government by peaceful citizens participating in Tea Party demonstrations leads to domestic terrorism like the Oklahoma City bombing really is nothing new. Monarchs and others in government have been using that line to silence their critics for hundreds of years. Defense Secretary Robert M. Gates has warned in a secret three-page memorandum to top White House officials that the United States does not have an effective long-range policy for dealing with Iran’s steady progress toward nuclear capability, according to government officials familiar with the document. Several officials said the highly classified analysis, written in January to President Obama’s national security adviser, Gen. James L. Jones, came in the midst of an intensifying effort inside the Pentagon, the White House and the intelligence agencies to develop new options for Mr. Obama. They include a set of military alternatives, still under development, to be considered should diplomacy and sanctions fail to force Iran to change course. . .
Mr. Gates’s memo appears to reflect concerns in the Pentagon and the military that the White House did not have a well prepared series of alternatives in place in case all the diplomatic steps finally failed. I guess we should be glad that President Obama has realized, however belatedly, that we cannot afford to bet everything on his quixotic effort to change Iran’s course using overtures of friendship. It also seems to be surprisingly hard to say what the “break-even” point is for new unemployment claims. My google search found that everyone uses a different number, but recently numbers in the vicinity of 400k-425k seem to be the most common. On the verge of a bipartisan deal on financial reform, Democrats scuttled the talks, deciding they would rather have an election issue than a bipartisan deal. Fine, I’m sure I wouldn’t have liked the bipartisan deal anyway. According to Rasmussen, 42% would vote for Barack Obama, 41% for Ron Paul. Wow. That’s particularly striking when you consider that Paul would lose much of the right. I don’t think I could bring myself to vote for either. A disabled caravanner who kept a penknife in his glove compartment to use on picnics has blasted the authorities after being dragged through court for possessing an offensive weapon. Rodney Knowles, 61, walks with the aid of a stick and had used the Swiss Army knife to cut up fruit on picnics with his wife. Knowles yesterday admitted possessing an offensive weapon at Torquay Magistrates Court. He was given a conditional discharge. It wasn’t even on his person. Police found it in his car’s glove compartment along with other tools. Congress is poised to miss its April 15 deadline for finishing next year’s budget without even considering a draft in either chamber. Unlike citizens’ tax-filing deadline, Congress’s mid-April benchmark is nonbinding. And members seem to be in no rush to get the process going. Indeed, some Democratic insiders suspect that leaders will skip the budget process altogether this year — a way to avoid the political unpleasantness of voting on spending, deficits and taxes in an election year — or simply go through a few of the motions, without any real effort to complete the work. . .
Congress has failed to adopt a final budget four times in the past 35 years. . . If the House does not pass a first version of the budget resolution, it will be the first time since the implementation of the 1974 Budget Act, which governs the modern congressional budgeting process. Failing to adopt a budget resolution is probably bad for sound budgeting, but there’s a small silver lining. Without a budget resolution, Democrats can’t use reconciliation to ram their next insane scheme through the Senate. When the United States and European Union first signed their Open Skies aviation agreement in 2007, the U.S. airlines got the better of the deal, winning immediate access to European markets in return for promises for concessions in the future. European airlines, such as British Airways, warned that this made them hostages to fortune. As it turns out, they were right. The U.S. once again is giving in to protectionist tempation. President Obama should quickly change course and move toward truly free skies. 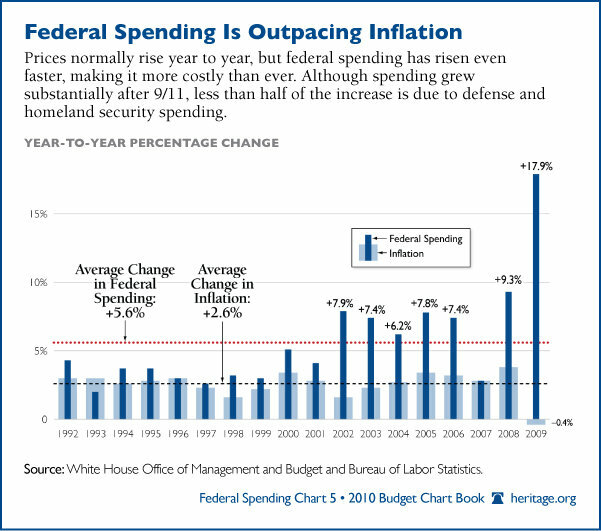 You think that the budget deficit increased from $459 billion in 2008 to $1,414 billion in 2009? Think again. The budget numbers you see bandied about on the news are computed the basis of cash, not accrued, so they don’t take into account liabilities that are incurred today but won’t be spent until later. The Financial Report of the United States Government reports the accrued numbers, and they are really grim. Including entitlements, the net position of the US Government was -$50.153 trillion in 2007, -$53.174 trillion in 2008, -$57.334 trillion in 2009. So the real deficit was $3,021 billion in 2008 and $4,160 billion in 2009. In terms of GDP, the net position was -356% in 2007, -368% in 2008, and -402% in 2009. The deficits were 21% in 2008 and 29% in 2009. Another way of looking at it is the difference in percentages, which tells us how much our debt worsened in relation to our ability to pay: 12% from 2007 to 2008, and a whopping 34% from 2008 to 2009. Unfortunately, none of that is the bad news. The bad news is that this all assumes current policy (e.g., no fixes to Medicare reimbursements or AMT), which absolutely isn’t going to happen. The worse news is that this doesn’t include Obamacare, so the 2010 report will be even worse. A House Energy and Commerce Committee spokeswoman tells me that Chairman Henry Waxman, D-Calif., has indeed cancelled the April 21 subcommittee hearing in which CEOs were to testify about Obamacare. So far, the only indication of this change appears on the committee’s website is on the Republican minority ranking member’s site. In fact, the hearing still appears on Waxman’s committee calendar for that day. . . The CEOs, required by law to be honest about earnings projections, re-stated their bottom lines in reaction to Obamacare’s passage, earning the ire of Waxman and other Democrats. Hearings on this matter would likely have proved an embarrassment to the Democrats and helped drag out discussion of Obamacare’s unexpected ill effects. Accounting basics: when a company experiences what accountants call “a material adverse impact” on its expected future earnings, and those changes affect an item that is already on the balance sheet, the company is required to record the negative impact–”to take the charge against earnings”–as soon as it knows that the change is reasonably likely to occur. This makes good accounting sense. The asset on the balance sheet is now less valuable, so you should record a charge. Otherwise, you’d be misleading investors. The Democrats, however, seem to believe that Generally Accepted Accounting Principles are some sort of conspiracy against Obamacare, and all that is good and right in America. President Obama has struck a nuclear deal with Russia. That deal sets a warhead limit that is smaller than the number we have but greater than the number Russia has. It obtains no commitment from Russia to back sanctions against Iran, and it puts missile defense on the table. Is there anything about this deal that’s good for us? Honestly, I’m wondering. Obama can’t be this stupid, can he? Russia and Germany are colluding to screw eastern Europe again. This time, though, there may be a happy ending. Forty-seven world leaders are Barack Obama’s guests in Washington Tuesday at the nuclear security summit. Obama is holding bilateral meetings with just 12 of them. . . One of those left out was Mikheil Saakashvili, president of Georgia, who got a phone call from Obama last week instead of a meeting in Washington. His exclusion must have prompted broad smiles in Moscow, where Saakashvili is considered public enemy no. 1 — a leader whom Russia tried to topple by force in the summer of 2008. . .
Saakashvili’s exclusion from the bilateral schedule is striking considering his strong support for U.S. interests, such as the wars in Iraq and Afghanistan. Georgia sent as many as 2,000 troops from its tiny army to Iraq. It will soon have nearly 1,000 in Afghanistan; 750 are being sent to fight under U.S. command. U.S. envoy Richard Holbrooke noted last month that Georgia’s per capita troop contribution would be the highest of any country in the world. Obama thanked Saakashvili for that help in their phone call last week. But according to a Georgian account of the call, Obama didn’t say anything about Georgia’s aspiration to join NATO, or about Georgia’s interest in buying defensive weapons from the United States. Whether we like it or not, we remain a dominant military superpower. I’m guessing he had his teleprompter off for that one. Prince George’s prosecutors have begun a criminal investigation of three county police officers who beat an unarmed University of Maryland student with their batons after a basketball game last month in an incident that was caught on video and surfaced publicly Monday, authorities said. County police also ordered an internal affairs investigation of the three officers, Maj. Andy Ellis said. Ellis said the inquiry would also focus on a county officer who filed official charging documents that are contradicted by the video. . . Charging documents say McKenna and Donat provoked the beating by attacking officers on horseback. The video clearly shows the officers rushing McKenna and beating him, although the teenager had not touched any of the mounted units. The charging documents also say that the horses injured McKenna and Donat and make no mention of the beating by the officers. The video shows no aggression by the horses. The unprovoked beating under cover of authority is bad enough, but then they fabricated a story to justify their attack. These people need to go to prison. The other officers that stood by and watched it happen need to be fired too, but there’s no way that will happen. Female staff who follow the Islamic faith will be allowed to cover their arms to preserve their modesty despite earlier guidance that all staff should be “bare below the elbow”. The Department of Health has also relaxed rules prohibiting jewellery so that Sikh members of staff can wear bangles linked with their faith, providing they are pushed up the arm while the medic treats a patient. The Mail on Sunday reported the change had been made after female Muslims objected to being required to expose their arm below the elbow under guidance introduced by Alan Johnson when he was health secretary in 2007. The rules were drawn up to reduce the number of patients who were falling ill, and even dying, from superbugs such as MRSA and Clostridium difficile. When government runs medicine, proper medical practice is just one consideration, and not even the primary one. That’s our future. Providing proof-positive that Congress didn’t read the health care bill before it passed it, it turns out that Congress accidentally stripped itself of its health insurance. Members of Congress and some of their staff are required to participate in the exchanges, but, as written, they lose their current insurance now and the exchanges won’t exist for years. This is the first thing about the bill that I like. If Democrats thought that opposition to health care nationalization would go away once the bill was passed, they are to be disappointed. According to a new Rasmussen poll, opposition to the health care travesty continues to harden. Today, 58% support repealing the bill, against just 38% who oppose repeal. On the day of the vote, the numbers were 54/41. Supporters of repeal also have the advantage of fervor: 50% strongly support repeal, against just 32% who strongly oppose it. How can we learn to say no? The federal government is now starting to build the institutions that will try to reduce the soaring growth of health care costs. There will be a group to compare the effectiveness of different treatments, a so-called Medicare innovation center and a Medicare oversight board that can set payment rates. 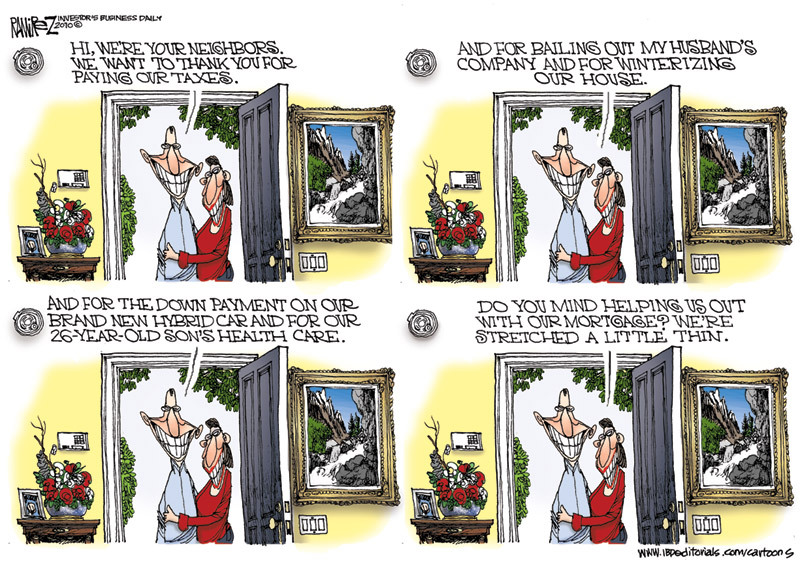 . .
Health reform will fail if we can’t sometimes ration care? Now they tell us. President Obama’s new nuclear doctrine is insane. Since the United States abandoned chemical and biological weapons, our policy has been that weapons of mass destruction form their own category. Any nation using WMDs against America could expect to face nuclear retaliation, that being the only form of WMDs we now have. This served as a good deterrent. Obama apparently thinks that we are somehow safer if we reassure the world that they can use WMDs against us without facing retaliation in kind. That is simply insane. The federal stimulus act has performed “exactly” as the Obama administration expected it to, Council of Economic Advisers Chairwoman Christina Romer said Sunday. . . This handy chart (from Innocent Bystanders) overlays the Obama administration’s prediction (dark blue) with actual numbers (red) and the administration’s current prediction (green). 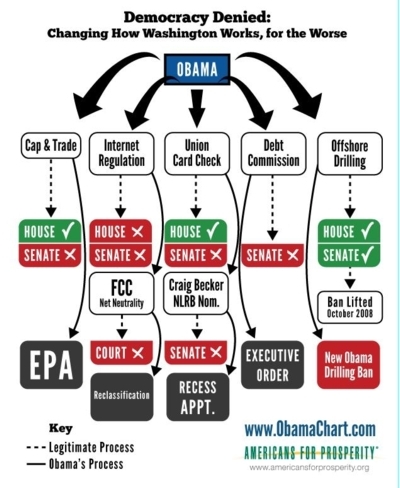 The administration’s worst-case scenario, if their stimulus were not enacted, is shown in light blue. Romer herself (with Jared Bernstein) prepared everything in blue, and the green is based on her House testimony (with Geithner and Orszag) last month. Clearly, the stimulus did not perform as we were told. Unemployment immediately soared well above the no-stimulus curve — to say nothing of the curve we were promised — and shows no sign of getting back down to either curve in the near future. That light blue curve is looking pretty good now. So if Romer says that the stimulus performed exactly as the administration expected, we have to ask: Is she lying now, or was she lying then? It’s one or the other. I guess I should have expected this. If you’re determined to nationalize the internet, why let defeat in Congress and in court stop you? The U.S. could regain its authority to pursue both network neutrality and widespread access to broadband by formally reclassifying Internet access as “telecommunications services,” a former adviser to President Obama said in a published report on Sunday. Susan Crawford, who was a special assistant to the President for science, technology and innovation policy, wrote in the New York Times that, before it can reclassify Internet access, the U.S. Federal Communications Commission has to prove “good reason”. . .
Crawford said if Internet access is reclassified as “telecommunications services” rather than as “information services,” it would make it easier to tell providers of high-speed Internet access what to do. Of course, Barone’s first rule applies, but still, it’s striking. And that’s without even looking at the health care process. Politicians use the tax code to encourage things they like, such as driving hybrid cars, and to discourage things they don’t like, such as work. This week it became impossible in Massachusetts for small businesses and individuals to buy health-care coverage after Governor Deval Patrick imposed price controls on premiums. . . The Massachusetts small-group market that serves about 800,000 residents shut down after Mr. Patrick kicked off his re-election campaign by presumptively rejecting about 90% of the premium increases the state’s insurers had asked regulators to approve. Health costs have run off the rails since former GOP Governor Mitt Romney and Beacon Hill passed universal coverage in 2006, and Mr. Patrick now claims price controls are the sensible response to this ostensibly industry greed. . . Until the matter is resolved, the insurers have simply stopped selling new policies. A court decision is expected by Monday, but state officials have demanded that the insurers—under the threat of fines and other regulatory punishments—resume offering quotes by today and to revert to year-old base premiums. Got that? Massachusetts’s price controls have made it so that its insurers would prefer to stop doing business. Now the state is trying to force them to continue doing business against their will. The Soviets tried the same thing, and they had to build walls to keep people from leaving. Victor Davis Hanson tries to figure out President Obama’s foreign policy. He also predicts what will happen next (nothing good). POSTSCRIPT: Obama’s take on this is particularly phony since he represents the Democratic Party’s wine track, and was only able to take up the blue-collar banner after he defeated Hillary Clinton. To edit your profile on Verizon’s web site, you need both your password and the answer to your “secret” question. I don’t think they are correctly understanding the principle behind the secret question. Since secret questions are insecure and I never lose passwords, I often put random junk into the secret question field. That worked out poorly for me in this case. Wired has an article about Apple’s upcoming iPhone OS 4.0. The good news is it will support multitasking. The bad news, multitasking won’t work on the original iPhone or the 3G. Boo. This exemplifies the Democratic Party’s disdain towards the American people as well as anything I’ve seen. POSTSCRIPT: Probably she doesn’t know how the bill works herself. POST-POSTSCRIPT: Refrigerators aren’t all that complicated, actually. A reader asked me to comment on this story, on how some historians are apparently upset over the new history curriculum mandated for the state of Texas by the Texas board of education. I’ve not been following the story. My sole exposure to the controversy was a completely pointless argument about whether Friedrich Hayek’s work was important enough to merit inclusion in the economics curriculum. (Answer: I’m not sure that you need to be studying particular economists at all. But if you are, Hayek is obviously one of the giants, if only for his work on price signals. Liberals don’t like him because his work argues against central planning.) In regards to history I’ve read nothing, but I can make a few quick comments. First, the very fact that there is a controversy argues against centralized control of education. If curriculum choices are made locally, schools can decide for themselves what to teach. If a particular school makes a bad choice, it’s no big deal because its influence is limited. Unfortunately, some big states (notably California and Texas, and no doubt some others) centralize curriculum decisions for their entire state. That’s a horrible idea, and this illustrates why. Second, the story is not very helpful in explaining what the board is doing that historians disagree with. The story contains not a single quotation of any historian making a specific objection. Instead, the story relies on vague, unsourced, indirect quotes (“historians say. . .”). That sort of weaselly writing is first cousin to the standard ploy for editorializing in a news story (“critics say. . .”). The curriculum plays down the importance of Thomas Jefferson. If true, that’s pretty stupid. The debate between the Jeffersonians and the Hamiltonians was very important in the early years of the republic. Even though Hamilton ultimately won the debate, I don’t see how you can tell the story without Jefferson. Plus, Jefferson was president for two terms. But I’m trusting the Post’s description here. If, on the other hand, the curriculum merely says that Hamilton’s vision won out over Jefferson’s, it’s no more than the truth. The curriculum questions the separation of church and state. This is too vague to respond to. Certainly there was no such separation in most of the states, and whether it was intended to exist in its modern form even at the federal level isn’t clear. I could easily see this being good or bad, depending on what it actually says. The curriculum says the government was infiltrated by communists during the Cold War. This is no more than the truth. If anything, the curriculum makes a mistake by relying on just the Venona decrypts. Alexander Vassiliev’s notebooks (hand-copied from the KGB’s files) are even more conclusive. On the other hand, if the curriculum tries to use that fact to rehabilitate McCarthy, I disagree with that. I’m not aware of any evidence that McCarthy’s witch-hunt did any good at all to balance the harm it did, and even if it did, the ends do not justify the means. The curriculum says Reagan should get more attention. Duh. The curriculum does not include hip-hop. I really don’t care. Call me a philistine, but I don’t see why trends in music should be part of the mandatory history curriculum in the first place. The curriculum places Jefferson Davis’s inaugural address alongside Lincoln’s. What do you expect from a southern state? Actually, it might be interesting to contrast the views of north and south this way. (Or perhaps not. I’ve never read Davis’s address so I can’t say.) Anyway, it seems possibly defensible. It’s not as though they’re putting something alongside the Gettysburg Address. In short, I wouldn’t be at all surprised if the Texas board of education is doing something stupid here, but I’m not going to take the Washington Post’s word for it. In any case, get rid of central control over schooling and the whole controversy disappears. A federal appeals court ruled Tuesday that the Federal Communications Commission lacks the authority to require broadband providers to give equal treatment to all Internet traffic flowing over their networks. The ruling by the U.S. Court of Appeals for the District of Columbia is a big victory for Comcast Corp., the nation’s largest cable company. It had challenged the FCC’s authority to impose so-called “net neutrality” obligations on broadband providers. The ruling also marks a serious setback for the FCC, which is trying to officially set net neutrality regulations. Because the FCC “has failed to tie its assertion” of regulatory authority to any actual law enacted by Congress, the agency does not have the authority to regulate an Internet provider’s network management practices, wrote Judge David Tatel of the U.S. Court of Appeals for the D.C. Circuit. The country’s chief tax collector pushed back Monday against assertions that working for the Internal Revenue Service has become more dangerous as a result of growing anti-government sentiment and the recent passage of President Obama’s health care plan. Fears that IRS employees could be targets soared after a Feb. 18 incident in which a disgruntled Texas software engineer flew a small plane into the side of an IRS facility in Austin. One longtime agency employee was killed in the attack. Some liberal groups and bloggers also have raised fears that anti-tax and anti-government rhetoric employed on talk radio and by protesters within the “tea party” movement could incite violence against IRS agents. I think that part of what’s going on is projection. When certain leftist groups get as angry as we are now, they do resort to violence, as witnessed by “anti-war” and anti-globalization riots. The problem is, it is less expensive for consumers — especially young and healthy people — to pay the monthly penalty of as much as $93 imposed under the state law for not having insurance, than to buy the coverage year-round. This is also the case under the federal health care overhaul legislation signed by the president, insurers say. Governor Deval Patrick recently filed legislation that state regulators believe will help fix the problem, by restricting insurance enrollment to twice a year for people who buy on the open market. Massachusetts residents will now be able to buy insurance only when the government says they can. And when that has an unforeseen consequence, they’ll come up with something else to restrict people’s freedom further. Moreover, it doesn’t even solve the problem. Limiting when people can sign up for insurance doesn’t keep people from dropping it when they want, and even if they did force people to stay in a plan for a full six months, the extra three months of premiums would be no more than a drop in the bucket compared to what the ne’er-do-wells cost. A new Gallup poll finds the demographics of the Tea Party movement are very similar to the nation as a whole. Tea Party supporters are essentially identical to the nation in age, education, and employment. As compared to a typical adult, a Tea Party supporter is slightly less likely to be a minority (21% versus 26%), slightly less likely to be female (45% versus 55%), and slightly less likely to earn less than $30k/year (19% versus 25%). The only areas in which the Tea Party movement differs greatly from the nation as a whole are political. A Tea Party supporter is slightly more likely to be an independent than the typical adult (43% versus 40%), but — unsurprisingly — is much more likely to be a Republican than a Democrat. Still, 8% identify as Democrats. Bottom line, the narrative promoted by Democrats and parroted by the legacy media in which Tea Party supporters are a white-male fringe group is wholly untrue. Welcome to April 2nd. And that means a deconstruction of what happened on April Fool’s Day when I announced that I was going to become the official White House law blogger. The basic idea was this: A bunch of law bloggers would try to punk the political bloggers, whose reputation is to grab any old rumor and run with it. Fact checking hasn’t always been the strong suit of this community. But the political bloggers, to their collective credit, didn’t bite, despite wide dissemination of the story. Not on the right or the left. Instead it was the vaunted New York Times that ran with the story without bothering to check its facts. To be fair, given the effort he put into the prank, I would have been fooled. I do my fact-checking using Google, not by contacting sources. So, it seems, does the New York Times. According to Rasmussen, 48% say that the Tea Party movement is closer to their views than President Obama; 44% say Obama is closer. Among independents, the gap is wider: 50-38. In the Bush years, we often heard the phrase “Bush regime” from some quarters of the left. So Limbaugh applied it to Obama. It was used 16 times in the New York Times. . . [and] 24 times in the Washington Post. . . Perhaps Matthews missed all of those references. If he did, he still might have heard the phrase the many times it was uttered on his own network, MSNBC. For example, on January 8 of this year, Democratic Rep. Joe Sestak said that, “In George Bush’s regime, only one million jobs had been created…” . . . They don’t remember this stuff because it seemed reasonable to them when they were the ones saying it. As long as we are requiring coverage of pre-existing conditions in the health insurance industry, I think we should do it for all forms of insurance. In particular, for power line insurance. To get my power service repaired, I would really much rather pay a few dollars than 10 grand. The power company can pass the cost on to the rest of its customers, right? For many of the members of the CBC, like John Lewis and Emanuel Cleaver who worked in the civil rights movement, and for Mr. Frank who has struggled in the cause of equality, this is not the first time they have been spit on during turbulent times. This afternoon, the Congressman was walking into the Capitol to vote, when one protester spat on him. The Congressman would like to thank the US Capitol Police officer who quickly escorted the others Members and him into the Capitol, and defused the tense situation with professionalism and care. After all the Members were safe, a full report was taken and the matter was handled by the US Capitol Police. The man who spat on the Congressman was arrested, but the Congressman has chosen not to press charges. He has left the matter with the Capitol Police. Presumably Cleaver is backing off the charge since a video surfaced showing that it was false. There’s been some buzz about an analysis of the Democratic stimulus package, showing that the stimulus bill spends much more in Democratic districts than Republican districts. But this is old news. Last December I noted an econometric analysis that showed that a district’s propensity to elect Democrats was the only statistically significant predictor of stimulus spending. Economic variables such as unemployment had no impact at all. UPDATE: I see now it’s actually the same study, updated with more recent data. But, as far as I know, the Obama administration is still financing offshore oil exploration in Brazil. A provision in the health care nationalization bill is forcing restaurants to reduce the size of their menus. You are currently browsing the Internet Scofflaw blog archives for April, 2010.